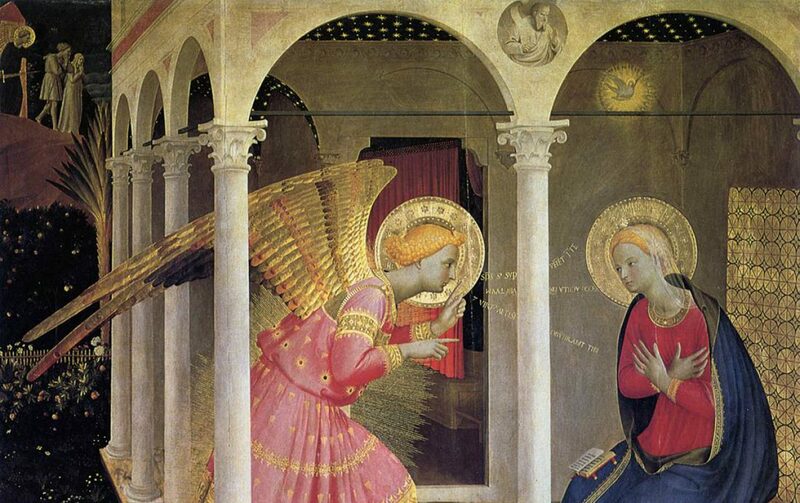 Soon after an article appeared in our Diocesan newspaper (The Rhode Island Catholic) in June 2011 on the Fra Angelico Institute for the Sacred Arts, I spoke on the phone with a talented artist by the name of Jamie Medeiros. We talked about the mission and goals of the Fra Angelico Institute and then she explained to me the mission of a group that she started at her parish in Tiverton, RI. Her group’s name is Oro et Creo (I Pray – I Create). I was fascinated by her description since it clearly was another example of the Holy Spirit’s continuing witness to get Catholics, and Christians of all denominations, interested in uniting the dual impulse of prayer and the creation of sacred art in all its various forms. The following interview (the first part of a three part series) with Jamie Medeiros and Deacon Tom Lambert illustrate how their combined efforts and continuing positive influence have opened up the creative and spiritual impulses of many people. The Lambert/Medeiros model can easily be replicated in your parish – regardless of where you are in the world. As of last week, this website/blog on The Fra Angelico Institute for the Sacred Arts, is read by people in 63 nations and on every continent except Antarctica. As far as I am concerned, these numbers are a clear example of how the Holy Spirit utilizes all resources to touch people’s hearts and move them back into a closer relationship with Him. Regardless of where you live in the world, and whether your parish is Roman Catholic, Greek or Russian Orthodox, Middle Eastern Catholic, or one of the Protestant denominations, the Lambert/Medeiros model of Oro et Creo, which unites personal prayer and the creative impulse within a church setting and in community with other artists, is a powerful tool of evangelization. 1) What inspired you to establish the Oro et Creo community? Jamie Medeiros (St. Theresa’s Parish Tiverton, Rhode Island): In Chicago at Our Lady of Mt.Carmel I had befriended one of the deacons [Deacon Tom Lambert] who had picked up art in his retirement. He asked if I would meet one of the RCIA candidates [Belinda Cook Blakely] who was a student at The Art Institute of Chicago. All three of us met after Mass one day and began a discussion about this common thread of art and God. We discussed the fact that there seemed to be a lot of artists in our parish. We joked, “we should start a group!” The Deacon didn’t miss a beat. He said, “We SHOULD start a group.” We proceeded to discuss what it might “look like” if we started one. This was just at the beginning of Lent . We all saw the movement of the Holy Spirit and thought the timing of this discussion was remarkable. We picked a day, wrote up a blurb for the bulletin and decided to see if anyone would show. They did. We named it Oro et Creo after the Benedictine motto Ora et Labora (Pray and Work). It is a time to pray while creating. We continue to sit in wonder of the role of it as ministry for its participants. Deacon Tom Lambert (Our Lady of Mt. Carmel Parish Chicago, Illinois): Oro et Creo started at Our Lady of Mt Carmel Church, Chicago when I introduced Jamie [Medeiros] and Belinda [Cook Blakely], two artists, to each other. They then approached me to start Oro et Creo because they didn’t find much connection between art and God in their work environments. Although both have moved on, Jamie to start an Oro et Creo group in Rhode Island, the group they started [here in Chicago] is still going on. For the translation of Oro et Creo I applied its meaning of ” I pray – I create” which says (to me) out of my prayer comes my creation. It is an invitation, a prayerful desire for one to create not a command to others, which is how I see Benedict’s Ora et Labora applying to his monks. [Deacon Tom and Jaime are using the phrase differently then St. Benedict, since St. Benedict was speaking in the imperative, that is, he was giving a command to his monks: “Pray and Work.” Deacon Tom and Jaime, however, are using Oro et Creo, the Latin is spelled differently because it applies to an individual who prays and then creates, or creates while they are in a prayerful state – I Pray – I Create]. 2) How long has your Oro et Creo sessions been in existence, what Church did it begin in, and is it taking place right now – name and geographical location? Jamie: Oro et Creo first met during Lent 2008. We began it at Our Lady of Mt. Carmel Church in Chicago, Illinois. They are still meeting weekly on Monday nights. Here in Tiverton, Rhode Island, Oro et Creo began the summer of 2010, meeting weekly, and now meets once a month on Mondays (7 pm) at St.Theresa’s Church in Tiverton. 3) Is the clergy involved in any way? Can people in your area join at any time and who would they contact and when would they show up? Jamie: Here in Tiverton, our Pastor approved the program and likes to hear updates. People are welcome to show up. We meet at St. Theresa’s in Tiverton, RI on the first Monday of every month at 7 pm, unless it is a Faith Formation GIFT week. People are welcome to email me with questions. Deacon Tom: I am involved as a participant and [Parish] staff representative. The leader of the group is a layperson who is an artist. 4) How often do you come together to pray and create? Where do you actually meet – in the Church Hall, in the Church, at someone’s home? Jamie: We currently meet once a month on Monday nights from 7 – 8:30ish pm. This is open to change, depending on the seasons/ availability. We meet in the Church. Deacon Tom: We meet weekly. We start at the parish ministry center where we gather until everyone arrives. Then we have an opening prayer and then go in silence to the church or chapel. We sketch in silence for about an hour or more. People can sit anywhere in the church outside the sanctuary and sketch whatever they choose to do. Some bring pictures with them to sketch. We then go back to the ministry center where people may or may not choose to show the group what they were working on. Then a closing prayer is said. [Italics and boldface are my emphasis – Deacon Paul Iacono]. Part Two of this Interview with Jamie Medeiros and Deacon Tom Lambert will soon follow. In it they provide additional insights into this wonderful model which can easily be applied in your setting. Come on, what are you waiting for?!! Call one of your friends or church members who is creative, approach the parish clergy for permission to use the church for one hour a week, apply their model and get started! Thanks for this really interesting idea. I am mulling it over to see it is something that might work at my parish, which is a rather small one. I look forward to the rest of the feature/interview.